Thanks to the diverse testimony and all members supporting the coalition against SB993, we were able to address all the critical points that the committee needs to consider, from small business impact to competitive disadvantages and implementation challenges. The Senate Governance and Finance Committee, on the morning of May 16th, 2018 held SB 993 (Hertzberg), declining to vote on the bill that proposes to tax services purchased or used by businesses in California. Instead, the committee plans to hold several additional hearings on the issue. The next hearing is scheduled for June 13. Senator Mike McGuire, who chairs the committee, said the hearing will include a panel discussion. He said this hearing and others will provide a “deeper dive” into the issue of taxing services. We will continue to follow this issue and keep our membership informed. CalGeo is pleased to announce that we were able to join the coalition against SB 993 in May 2018 by being added to this coalition letter. Creates Competitive Disadvantages for California Employers. State and local taxes represent a significant cost for employers, and consequently are a key factor in business planning decisions. Determinations of where to locate or expand operations are influenced by assessments of relative tax burdens across multiple states. Already, businesses pay nearly 40 percent of the sales and use tax in California. Targeting them with an additional tax on services would put California at a tremendous competitive disadvantage. Imposes a Massive Tax Increase. SB 993 taxes all manner of services used by businesses in their daily operations, including many services performed by skilled workers who specialize in particular trades. This sweeping expansion would result in a significant tax increase, potentially in the range of billions of dollars a year. Even with a potentially lower tax on the purchase of goods, this proposal would increase a tax burden that already is among the highest in the nation – chasing away jobs and investment from many of California's key employers, including high-tech and manufacturing companies. Increases the Price of Everyday Goods. By taxing business inputs at multiple stages during the production process, this layering approach (known as “tax pyramiding”) increases overall production costs for everyday goods such as milk, bread, non-prescription medicines, etc. The cost increases on these and other products (which are exempt from the sales and use tax and will not benefit from the proposed rate reduction) ultimately will be passed on to consumers in the form of higher prices. This tax increase disproportionately hurts working families, as higher business taxes negatively impact economic growth, lower wages, and reduce jobs. Costly Government Administration. In analyzing previous proposals to impose a sales tax on services, the former State Board of Equalization (now California Department of Tax and Fee Administration) estimated that program administration costs ranged from approximately $900 million in the first year to more than $600 million every year thereafter. With the complex structure envisioned in this bill (i.e., varying tax rates, exemptions for certain services only for those engaged in certain lines of businesses, apportionment methodologies between services used in state and out of state, etc.) state administration costs likely will exceed the previous estimates. Broad-Based Taxes on Services Have Failed in Other States. Due to the tremendous competitive disadvantages and tax administration/auditing difficulties, many states have repealed their taxes on services shortly after implementation. And many more states have held off from enacting the tax. Higher Taxes Are Unnecessary. The Legislative Analyst’s Office stated in its review of the governor’s proposed 2018-19 budget: “Under our current revenue and spending estimates, and assuming the Legislature makes no additional budget commitments, the state would end the 2018-19 fiscal year with $19.3 billion in total reserves” – adding that revenue is expected to be even higher when the budget is revised in May with updated revenue collection data and possible economic stimulus from federal tax changes. When the state is bringing in surplus revenue, it simply is unnecessary to embark on the largest sales/use tax expansion in California history, targeted directly at businesses that employ California workers and fuel the state’s economy. As you may remember, CalGeo was part of a 2017 coalition that successfully helped Senator Canella pass Senate Bill 496 that limits the responsibility of design professionals to pay litigation defense costs to the degree that the design professional is at fault. This was a big win for the engineering community. The legislation became effective January 1, 2018. This year, the coalition developed an Advisory Letter that provides helpful language to update contract language in accordance with the new legislation. Download the Advisory Letter. 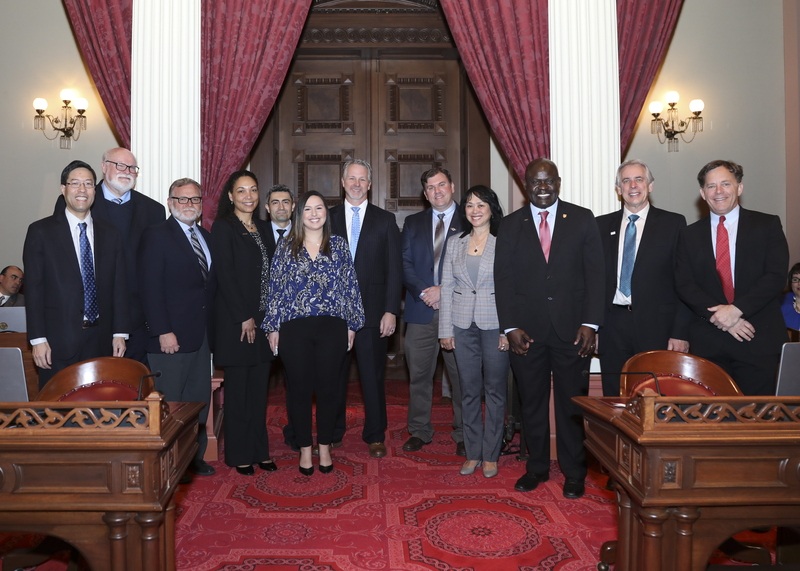 CalGeo participated in the development of the 2018 Engineers Week Resolution that was approved by the State Senate in February. This is an important document that recognizes the significant contribution of engineers in our society. CalGeo President, Bob Lokteff, was in attendance on the Senate floor when the resolution was introduced and approved. Download a copy of the Resolution language. CalGeo routinely meets with other California professional engineering and architecture associations to discuss legislation and build coalitions to enact, oppose and support new bills. In February 2018 CalGeo joined the coalition to support SB920. This bill proposes to eliminate the sunset on the ability for engineering firms to form LLPs to pursue projects. Download a copy of the Support Letter.